On January 1st, after two extra weeks of gestation and a handful of days in the hospital, we met the newest member the Wasted family. The last six-ish weeks have been humbling to say the least. 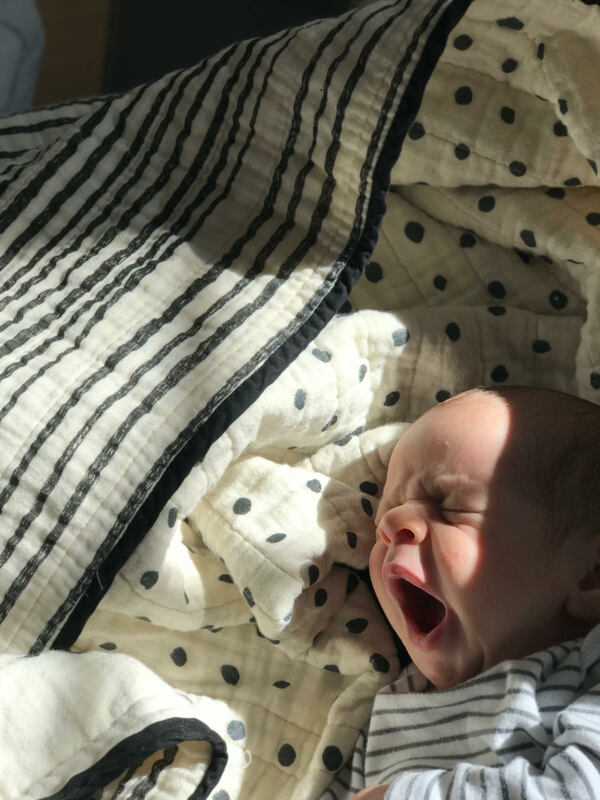 I laid out what I thought was a reasonable list of activities to keep me occupied during the last bit of pregnancy and the first sleepy newborn month of maternity leave. It included things like ‘finish Dr. Wasted’s coat’ and ‘sort fabric scraps’. This little dictator is a decent sleeper from what I now understand about newborns, but we’re lucky in this house to get a long enough quiet stretch to make a meal, nevermind the for-now superfluous goals about hobbies. BUT. I do have some things to share. Things like baby blankets! Three of them. These were all made during pregnancy, and they all use Nani Iro fabric from Miss Matatabi. I really like Nani Iro stuff, but it just doesn’t slot in well to my wardrobe of solids. The only thing I can ever think to do with it is make baby blankets. See. I washed all of these fabrics on hot and dried them before making anything because ain’t nobody got time for worrying about putting puked-upon baby blankets in the washer. We stuck with mostly blacks, grays and whites in the kid room (see also: most of our house), and I wanted to keep the blankets appropriately neutral. Mostly. 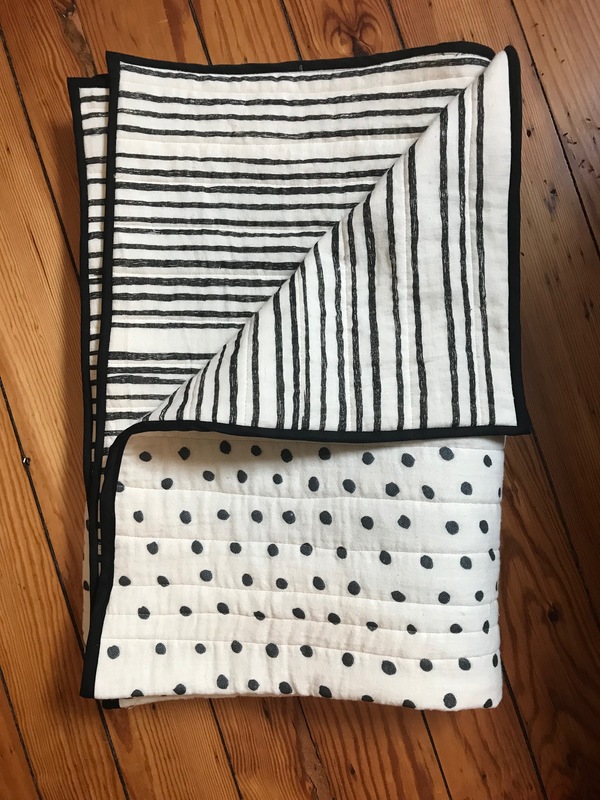 Up first, the crib sized quilt pictured above made from double gauze — one side stripes, the other side dots — from the Beau Yin Yang Nani Iro line. I used 1.5 meters of each fabric and a crib size cotton batting. I did not GAF about pretty quilting lines, as you can see below if you really strain your eyes. The stripes aren’t straight or evenly spaced, so I just quilted straight-ish lines between every third stripe or so. I feel like erratic quilting lines work just fine especially on the double gauze. After a few washes, the two layers of the gauze kind of crinkle up a bit and so the quilting lines don’t stand out in the same way as on normal quilting cotton. Next, this smaller ‘stroller’ blanket, which was a happy accident. I originally had other plans to use it with the other stripes and dots, but I hadn’t paid enough attention when ordering; it’s a quilting cotton, so wouldn’t have felt quite right with the gauze. I ended up just cutting the 1.5 meter length in half and using the same fabric for the front and the back, using the same cotton batting between the layers. 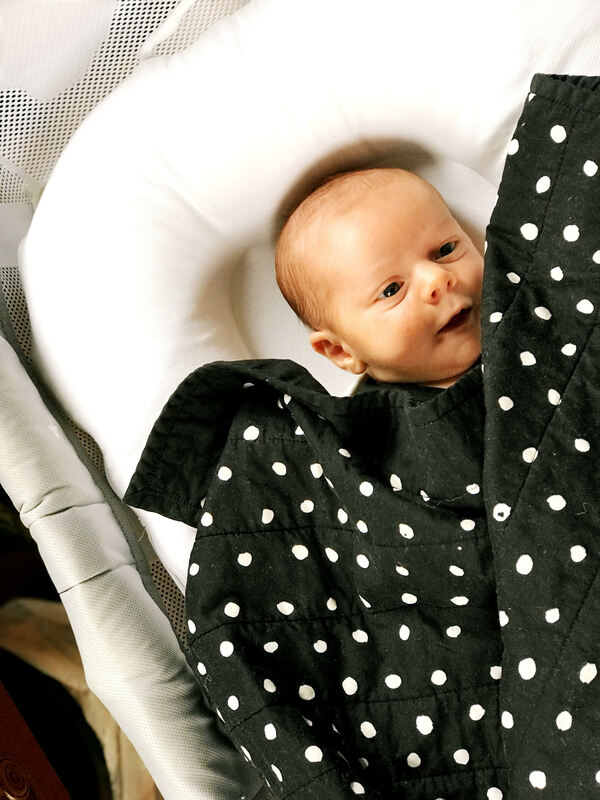 This is definitely the better sized blanket for putting on him in the stroller or car seat, or carrying around. And finally, the laziest effing blanket you ever did see. Speaking of binding, though, I think I’m really bad at it? Unlike past baby blankets where I folded the edges of the backing forward to create a faux binding of sorts, I made black bias binding out of some thin cotton I had lying around. But when I would ’stitch in the ditch’ on the right side, I kept not catching the edges of the binding properly — sometimes missing it entirely. I tried trimming down the seam allowance once I attached the first side of the binding, I tried not doing that. I tried pinning, I tried not pinning. Is this just a lack of practice or is there some secret to perfect binding attachment I’m just missing? BUT. It has a collar! To review, I’d opened up the back and shoulder seams a lot to get the coat to fit Dr. Wasted. I had the muslin of the original collar piece, but it no longer fit given how much the neckline had expanded to accommodate the fitting changes. I thought I was going to need to draft a new collar entirely. 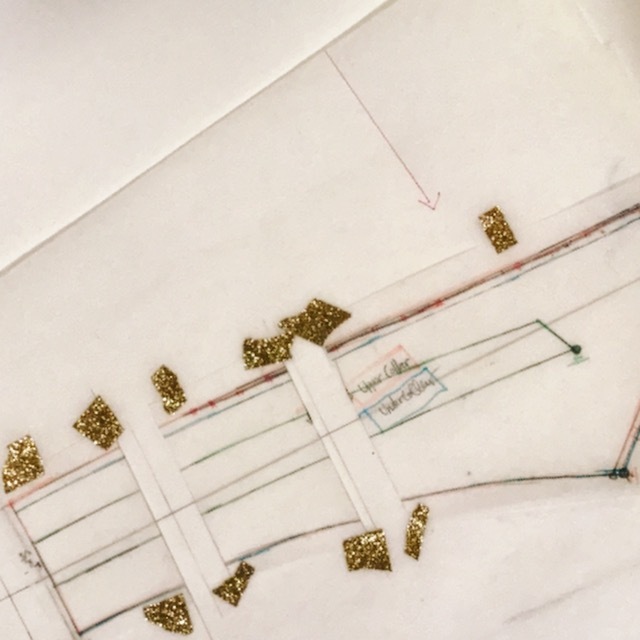 After a lot of planning, I ended up using the ‘ask the teacher’ function in the Craftsy collar drafting class I purchased when I was much more ambitious. I asked Suzy Furrer if I was on target with the ideas in this post. She responded (quickly), and was like ‘Eh, why don’t you just slash and spread.’ That’s similar to the advice from Beth way back when. So I got out the collar, and I also found a collar stand piece and an undercollar piece I had abandoned at some point, thankfully, and slashed and spread them in all the same places. It totally worked. The muslin looked decent, but the outer edge was pulling some, so I cut perpendicular to the edge right up to the seam line to see how much the collar wanted to open out by. That resulted in these pattern pieces. The collar isn’t perfect; mostly the collar points don’t curl under quiiiiite enough for me and you can see the undercollar peaking at times. But I’ll take it. Before going to the hospital for induction I managed to get one sleeve attached and just have to get the lining installed. 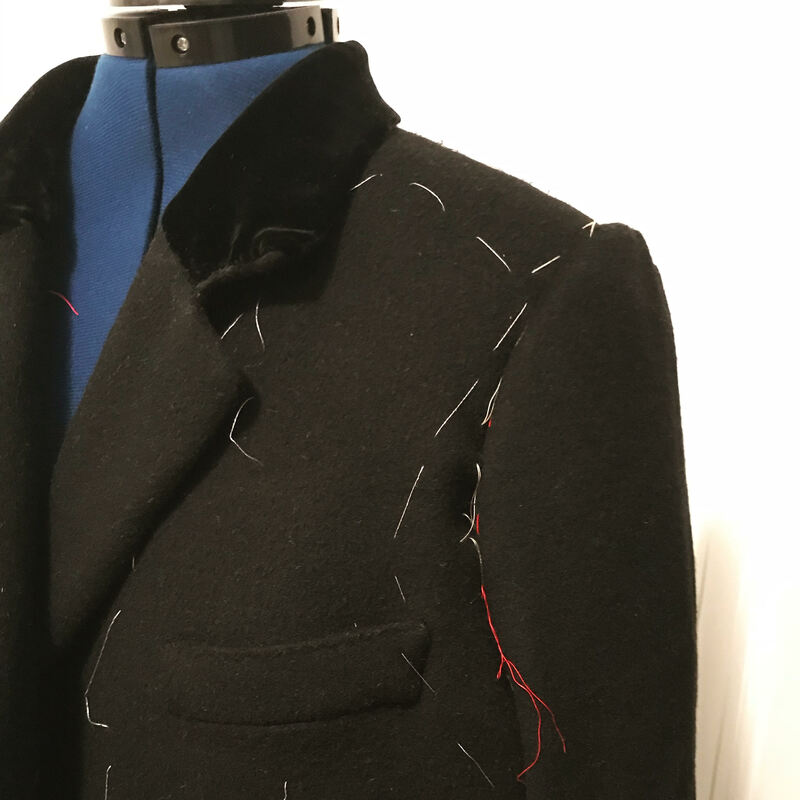 [I’ve been using this excellent tailored coat sew-along from Thread Theory, by the way. It’s very, very good.] Since coming home from the hospital, it’s been harder to get around to this project — what with needy newborn and all. Still, one more sleeve, buttons and buttonholes, and we’re done. Glad I didn’t bin it. 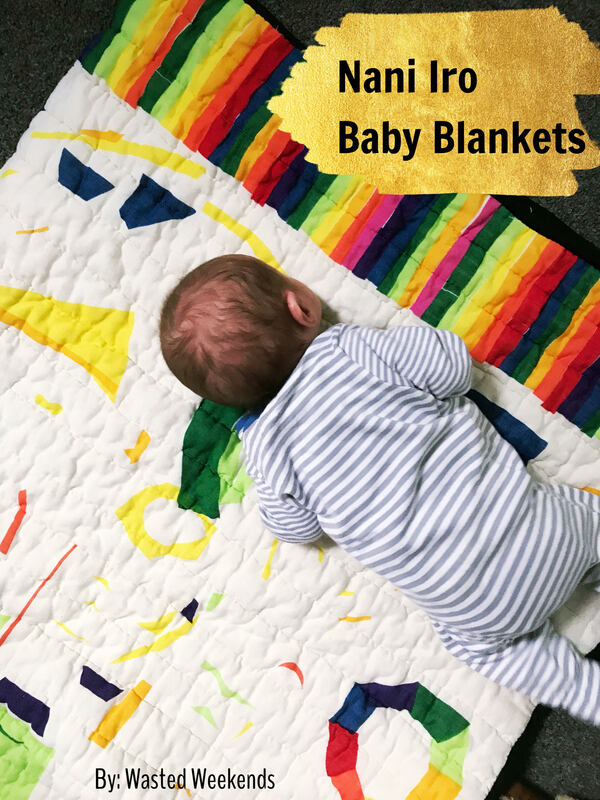 These are lovely blankets, but more importantly, you have one lovely baby! Congratulations!! Ohhh – a newbie baby!!!! Sooooo delicious,what a sweetheart. And congrats to you – your story sounds somewhat akin to mine, albiet 2 weeks earlier! I was ‘due’ on the 1st of Jan, but went two weeks over also. Bubba was finally extracted 42+1! Can’t believe you actually even had energy to pump out all those bunny rugs, let alone brain properly for the jacket collar. All I was capable of in my final month was sleeping on the couch!!! Oh well happy a-little-belated to yours then! And I definitely wasn’t braining properly, but was able to take instruction. It was also the only thing I was doing. The added required nap time meant I stopped working on my due date, and then spent the next couple weeks basically sleeping and sometimes sewing. congrats and I love the phrase “the little dictator” so true! adorable photos and very cute blankets. Have you tried using your sewing machine’s binding pressure foot? What an absolute sweetheart you have. Lovely quilts/ blankets and good luck with the collar. Thank you! He seems a bit more of a sweetheart since we started putting him down earlier and he’s sleeping longer! Ahh. Congrats! I’m 10 weeks in and totally understand now the small achievement of making dinner, and perhaps occasionally both eating it together at the same time! 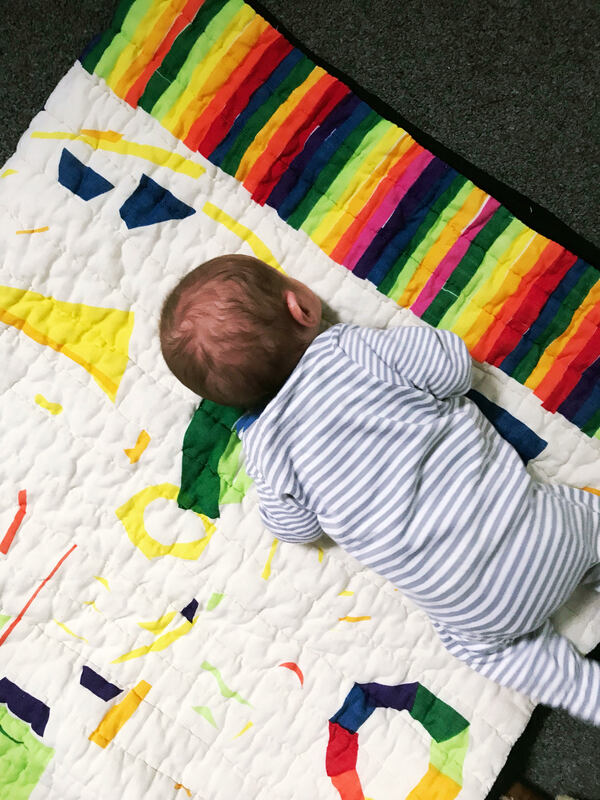 I’ve just been able to start a little sewing again for sanity (a couple of pairs of undies) and you remind me I need to bind the edges of some little quilts I made my little dude in the last weeks before he was born. Hope all is going well for you all. It’s impossible to know just how joyful and how hard it can be until you’re thrown in the deep end of it all. Thrown in the deep end indeed! And congratulations! We started trying to him down before 7 and have gotten to eat dinner together a couple times since then (pre-made stews tho… no chance of making and eating together on the same night). 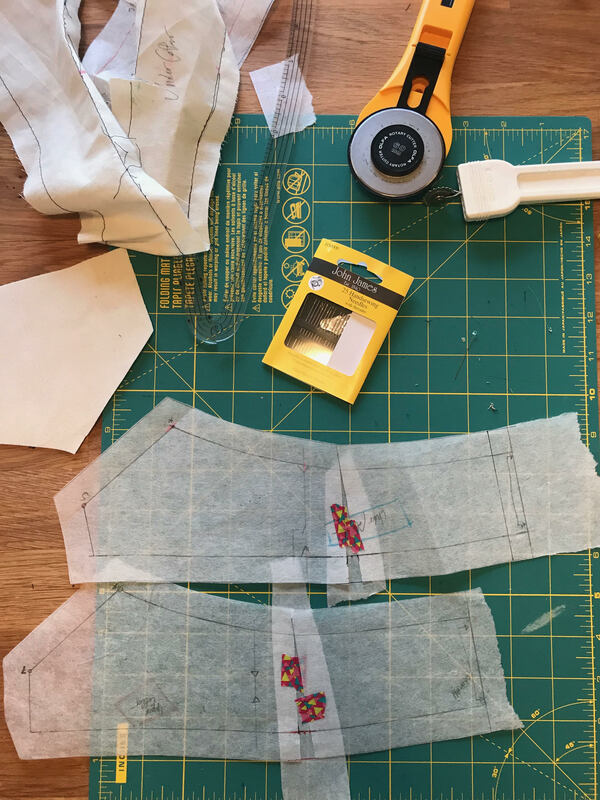 All I’ve managed to do in the sewing front is cut out about six pattern pieces.